As we celebrate the dishes everyone should fly to try, we’re also highlighting homegrown versions that you can order in a city near you. First up is curry. Curries can be found all over the world, most notably in Asian countries. Whether it’s a wintery day and we want warmth in a bowl or a scorcher of a day and we want to fight fire with fire, we’re all about curry any time of year. 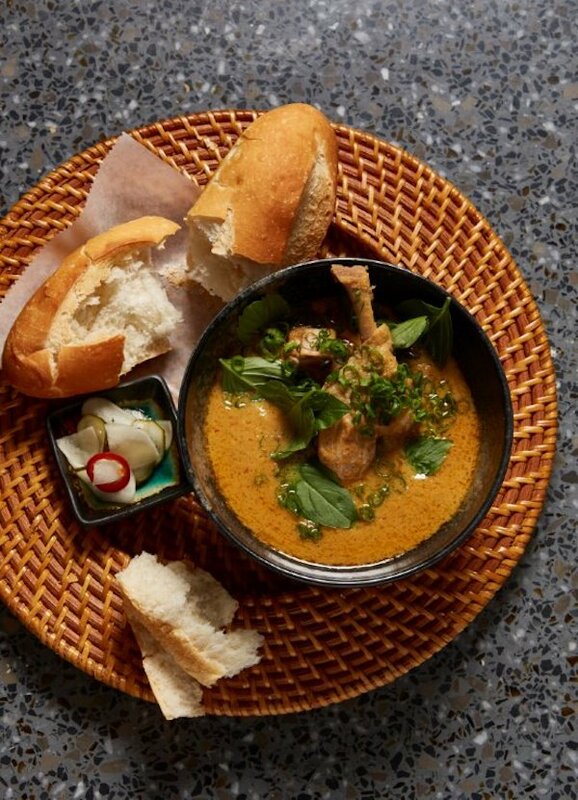 If you can’t travel to sample the lauded coconut and turmeric curry of blue swimmer crab with calamansi lime at Nahm in Bangkok, try one of these closer-to-home top curry dishes. And be sure to enter our #WillFlyForFood contest for a chance to win a trip for two to Mexico City. How does a carnivore create a vegetarian masterpiece? Executive chef Chris Gawronski says, “As someone who identifies as a carnivore, I often have a hard time enjoying vegetarian dishes because they can lack depth. 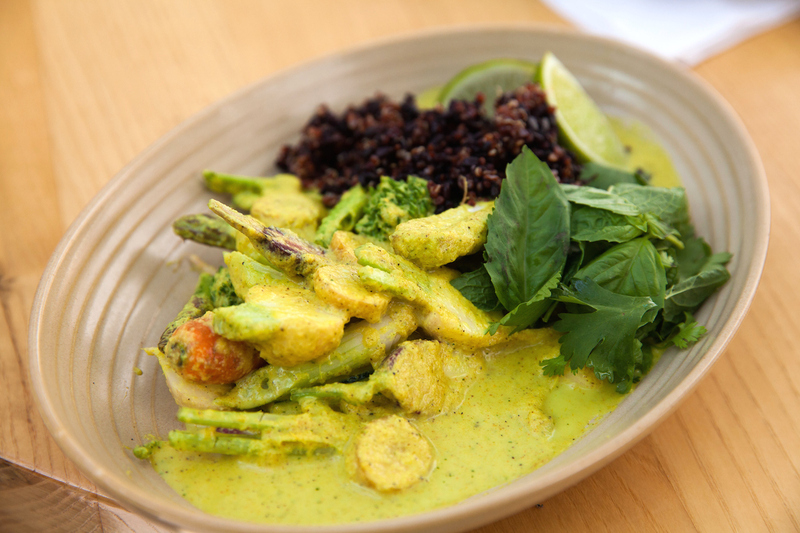 While at dinner with my father at a Thai restaurant years ago, I had Thai Coconut Curry for the first time and loved it for its complex flavor. 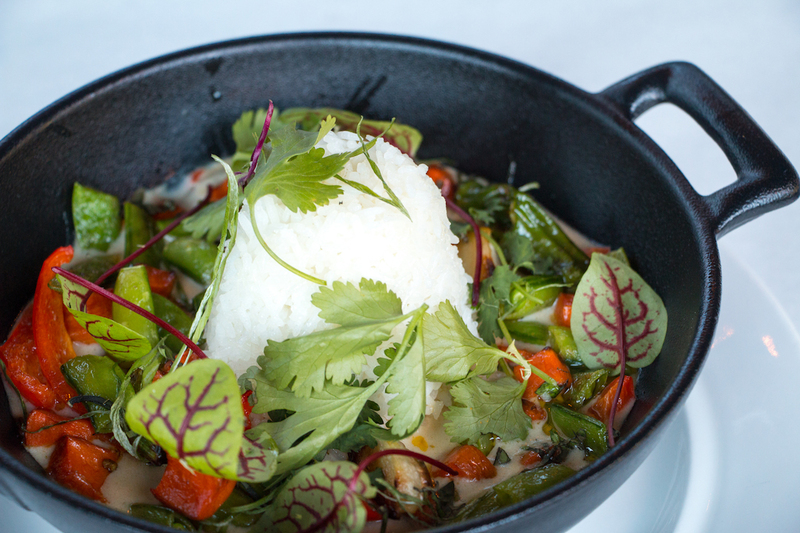 I thought it was a perfect vegetarian dish to include on The Gage menu.” His version is crafted from basmati rice, basil, and roasted seasonal vegetables – and it’s full of flavor. Make a reservation at The Gage. 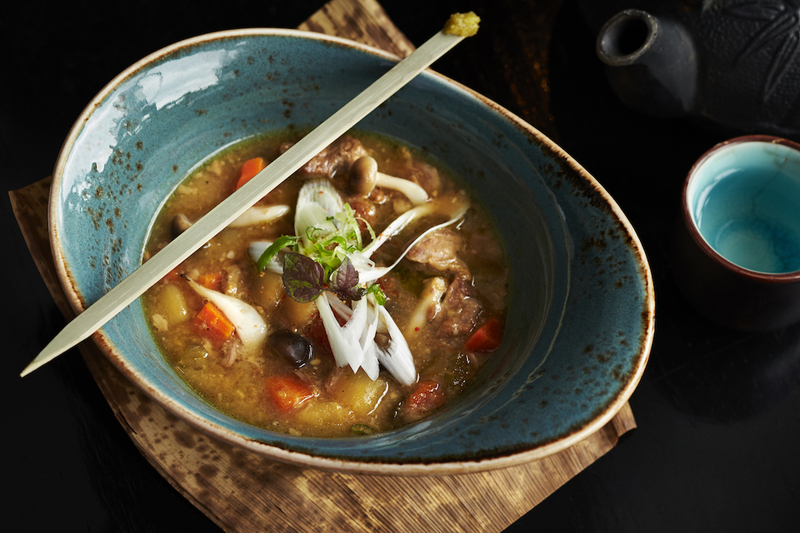 You can’t have a listicle of curries without having a Japanese curry on it – especially this iteration from executive chef Yo Matsuzaki. Chef Yo highlights panko-crusted pork jowl in his Ton Toro Katsu Curry, which features a sauce of housemade Japanese curry with a soft boiled egg. Make a reservation at Zentan. Veggie lovers rejoice! 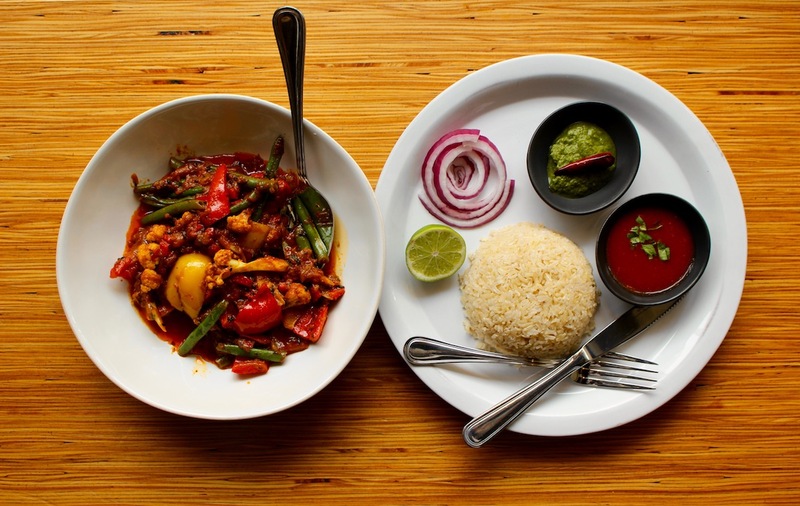 The Shrestha brothers have created a vegetable jalfrezi with sautéed peppers, spiced cauliflower and green beans, and spices. It’s finished with a bit of lime, a dash of onion, and a spoon full of brown basmati rice. You don’t want to miss this staple dish on Chiya Chai’s Nepalese and Indian-inspired menu. Make a reservation at Chiya Chai Café. Hit up Vietnam by way of Denver’s Cherry Creek neighborhood at Departures. Chef Gregory Gourdet, a Top Chef finalist, has created a Vietnamese duck curry. His riff is built with brined duck breast, fresh ginger, lemongrass, coconut milk, and red chili. You’ll be grateful for the accompanying baguette to help soak up all the yum. Make a reservation at Departure Restaurant + Lounge. 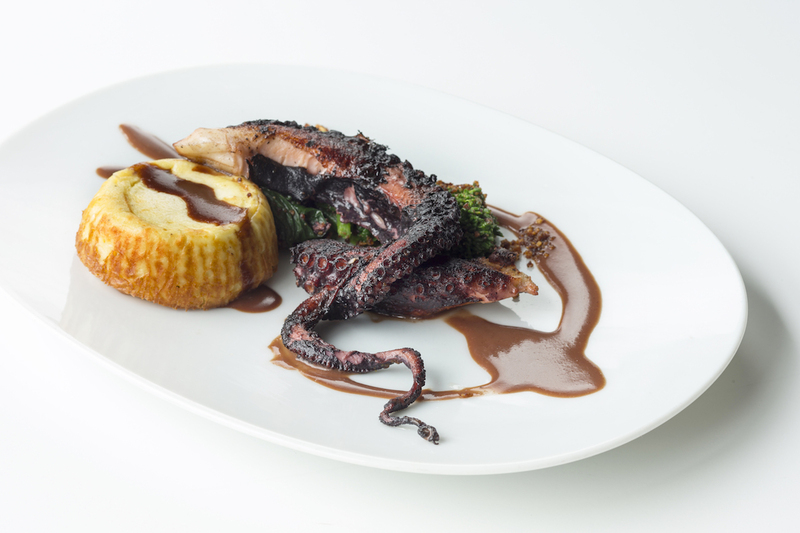 At Aviary, executive chef Sarah Pliner serves charred octopus with molten ricotta pudding, broccoli raab – and a red curry jus. The preparation echoes Plinr’s approach to everything on her menu — clean and minimal with an incredible complexity of flavors. While not traditional, this dish is bold and unique – just what we’ve come to expect from a meal at this PDX fave. Make a reservation at Aviary. 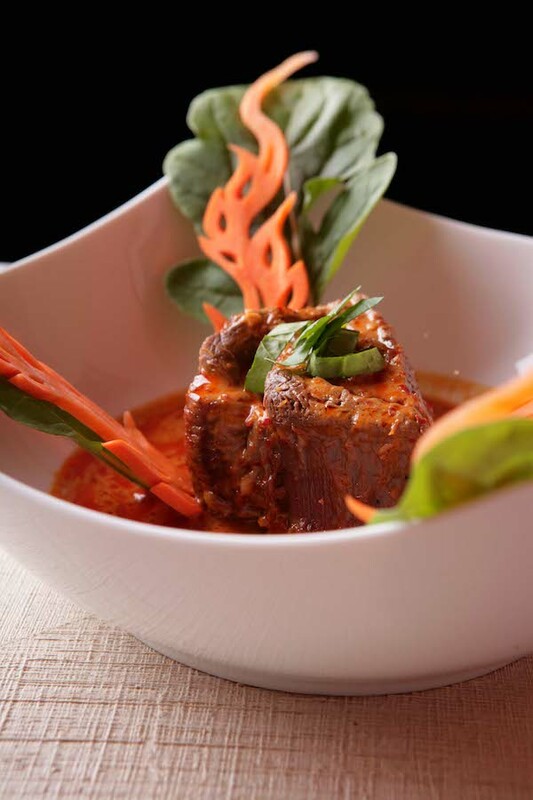 The Massaman beef green curry at the Thai fine-dining restaurant that is Arun’s is made to please your palate – and your Instagram following. Part of the chef’s menu from chef Arun Sampanthavivat, the curry arrives flourished with hand-carved vegetable flames and leaves. The curry is bright and beautiful. Make a reservation at Arun’s Thai Restaurant. Chef Jeff Mahin adds a hearty, fresh and spicy vegan, gluten-free option to his California-inspired menu with the quinoa & forbidden black rice bowl that’s crafted with spicy green curry, roasted veggies, Thai herbs, and lime. Make a reservation at Summer House Santa Monica. Seared tuna is the star of Coco’s signature green curry sauce from chef Mike Ponluang. Other flourishes include sesame seends, edamame, fried banana, and seaweed diced mango. Make a reservation at Coco Asian Bistro. Oh my udon. 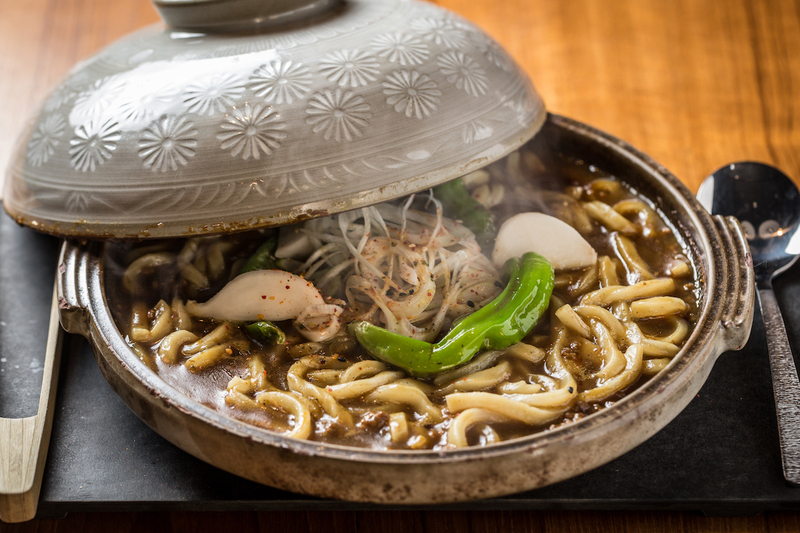 The curry udon at Momotaro is a bowl of goodness built around heritage pork curry and featuring futo udon. This is steamy feel-good food at its finest – guaranteed to perk you up even if you’re feeling less than fine. Make a reservation at Momotaro. You’ll want to make a habit of this shrimp curry. 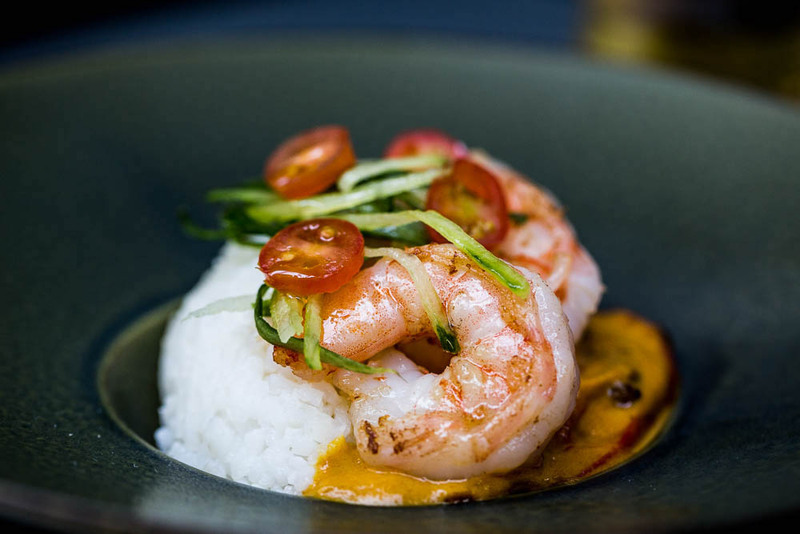 An Asian-fusion of curried shrimp, coconut milk, and eggplant from executive chef Kyoo Eom, it’s accompanied by a cooling cucumber salad. Make a reservation at Dirty Habit. 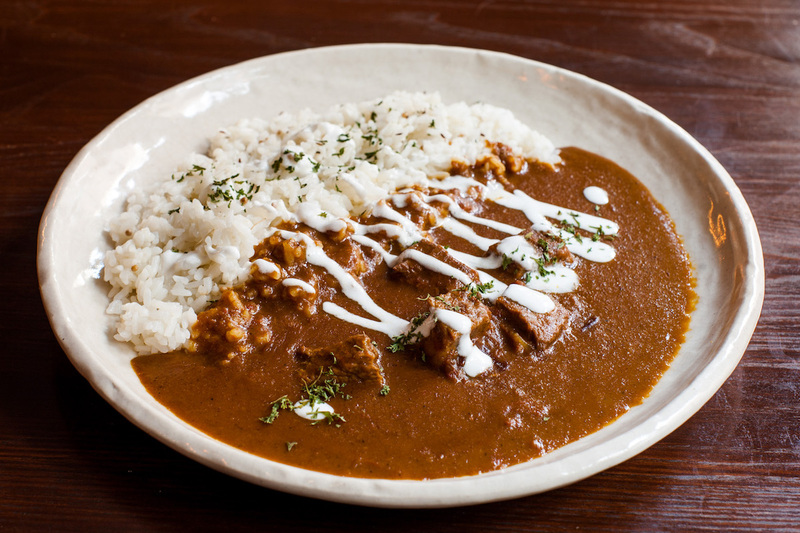 The 18 spice beef curry from chef Takanori Akiyama is made with tender beef brisket enrobed in a curry sauce forged from – you guessed it – 18 spices. Drizzled with charred garlic oil and yogurt to cut the spice, it comes on a bed of rice and it’s the perfect blend of hot, sweet, and salty. Make a reservation at SakaMai. 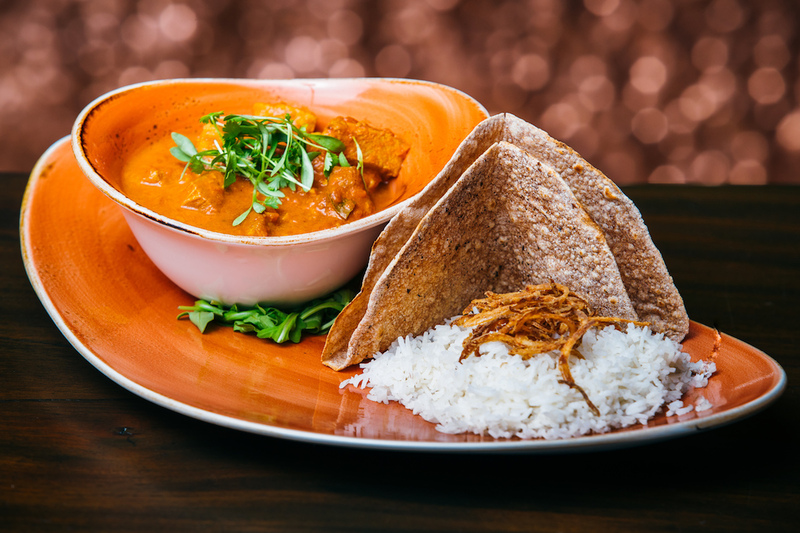 Experience a taste of authentic Western Cape-South African cuisine with the Angry Duck Curry at this restaurant that is named for partner and South African golfer Ernie Els. This curry showcases duck breast with a red madras curry. Served with flatbread and basmati rice, it’s the culinary equivalent of a hole in one. Make a reservation at Big Easy Winebar & Grill. 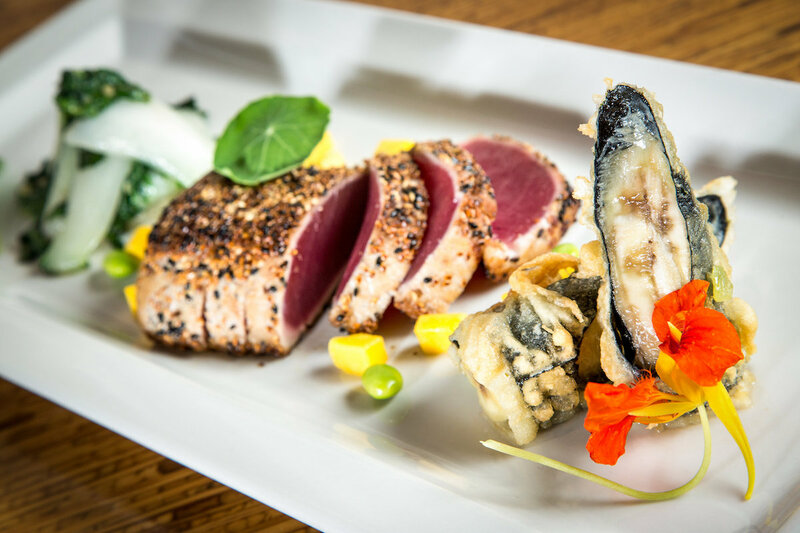 The premier South African fine dining restaurant in the U.S., 10 Degrees South remains a hidden gem of Atlanta’s booming culinary scene. 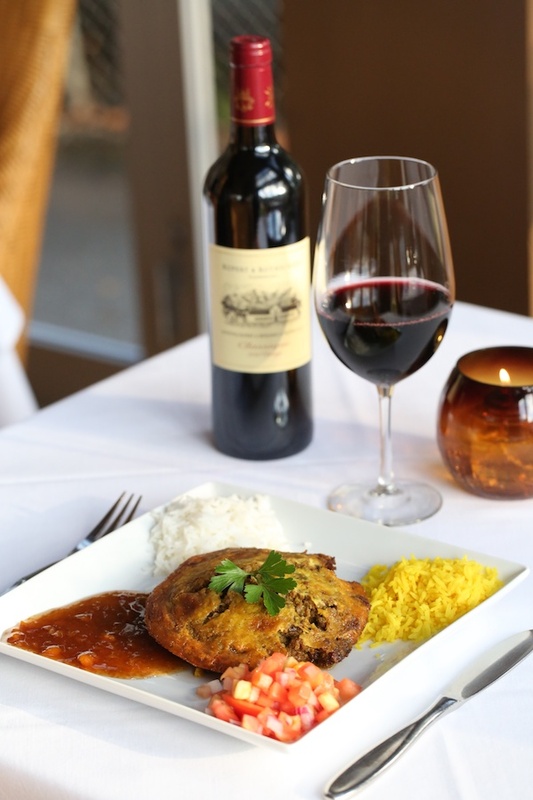 Led by husband and wife chefs Derek and Diane Anthony, both born and raised in Johannesburg, South Africa, the restaurant is owned by son Justin Anthony and serves traditional South African cuisine, including the signature South African curry that is found in many dishes, such as the beef bobotie. Make a reservation at 10 Degrees South. Have a favorite picture of a food you flew to try? Share with us to enter OpenTable’s #WillFlyforFood social media contest; for full details, click here. Prize includes dinner for two at the legendary Pujol restaurant in Mexico City, a walking culinary tour of Mexico City, round-trip airfare and three nights of hotel accommodations for two. To enter, share a photo of a delicious dish you flew for. Post it on Instagram, Facebook, or Twitter, or visit our blog for more options and tell us where else you dream of flying for your next culinary adventure. And, if entering on Instagram or Twitter, be sure to follow and tag @OpenTable and use the hashtag #willflyforfood so your entry is visible. Photo credits: John Valls (Aviary). Galdones Photography (Momotaro). Anjali Pinto (Summer House Santa Monica); Grove Bay Hospitality (Big Easy); Chiya Chai (Chiya Chai). This grouping seems strange on many levels. “Curry” is a broad term so perhaps it is not surprising that the dishes have such a broad range. While all the dishes seem to have some connection to “curry” it is strange to see a dish with a minimal sauce linked to curry grouped with a dish that seems to be a soup with udon noodles. So this list has no Indian curry restaurants?